I would like to thank Liz Rowley, Pierre Fontaine and Adrien Welsh for this invitation to speak. I am honored to join with you to celebrate the 100th anniversary of the Great Russian Revolution. 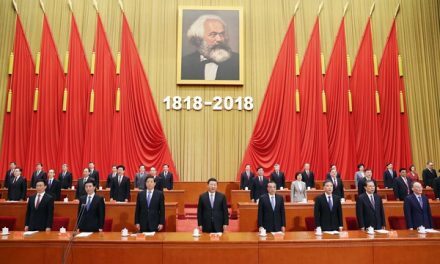 I bring you greetings from my comrades in MLToday.com, who have joined with other Marxist-Leninist parties and independent Marxist-Leninists to hold our own celebration in New York City on November 7. Your invitation reminds me of the long relationship between the Communists of both of our countries. In 1919, facing legal repression in Canada that prevented the formation of a communist party, Tim Buck and other Canadians, before forming the Communist Party of Canada, joined the Communist Party of America. Our gathering today testifies to our confidence that in spite of reverses, the Russian Revolution remains the most important revolution in human history and that socialism remains the only and inevitable path for workers and all oppressed people to free themselves from capitalist exploitation, racial oppression, imperialist war and the destruction of the global environment. 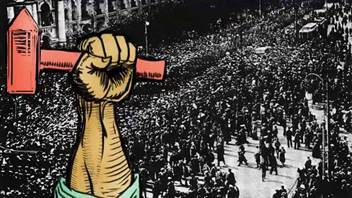 And the Russian Revolution remains the guide for how to achieve this goal, namely a revolutionary movement of workers, farmers and other oppressed people led by a by Marxism-Leninist party. For a 100 years the capitalist countries and their ideologues have attacked the Russian Revolution. These attacks began when Winston Churchill said that Bolshevik baby must be strangled in the cradle and 12 capitalist nations sent troops to Russia to do just that. It continued with Nazi invasion of the Soviet Union and then with the Cold War and with the relentless ideological offensive that equated fascism and socialism, Hitler and Stalin. And even after the demise of the Soviet Union, it continued with the idea that Soviet Union collapsed because socialism did not work because socialism goes against human nature. How are we going to win people, particularly the youth, to the fight for socialism, if they believe socialism is the same as fascism, or that socialism is doomed to failure? Clearly, we must counter these ideological attacks by educating ourselves and arming ourselves with a true understanding of the revolution. The Russian Revolution occurred after centuries of despotic tsarist rule, which had resulted not only in a country lacking basic democracy but also a country that though the fifth largest industrial power was comprised of people who for the most part lived in illiteracy and poverty. Life expectancy was only 40 years compared to 60 years in other industrial countries. The revolution occurred in the third year of a devastating war that had left 2,300,000 Russians dead and twice that many wounded. The army was defeated and demoralized. Shortages of food and other supplies plagued the cities. Demonstrations and strikes abounded. Women demanded bread. Workers demanded higher wages. Peasants demanded land. Almost everyone demanded peace. The revolution began on International Women’s Day (March 8) in Petrograd, the Russia capital, with a demonstration of women textile workers and a strike by 20,000 metal workers. The refusal of troops to fire on the women signaled the end of the Tsar’s rule. At this moment, none of these demands or demonstrations were in and of themselves socialist or revolutionary. But this movement culminated in November in the Bolsheviks assuming power and proclaiming socialism. 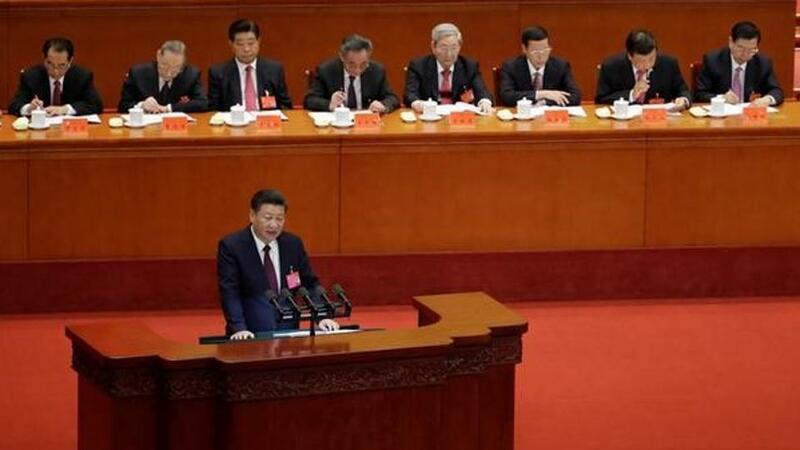 What transformed this institutional crisis and mass discontent of March into socialist revolution in November? Historians have made two mistakes in understanding this process. Some have underestimated and some have overestimated the role of Bolsheviks. They have underestimated the Bolshevik role by claiming that the main cause of the revolution was the institutional crisis of Tsarism and the spontaneous action of the masses. They have overestimated it by claiming that the Russian Revolution was a putsch, a coup by a handful of hardened revolutionaries. 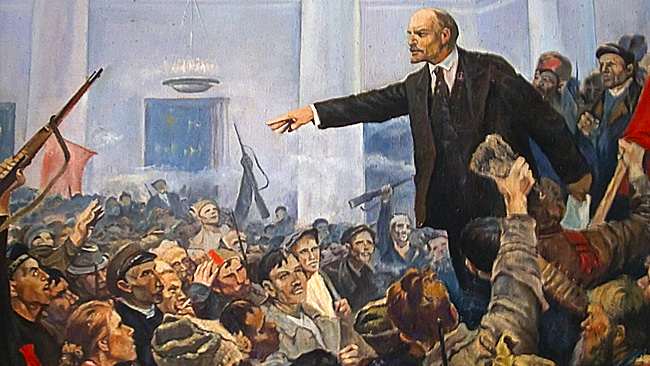 What made this revolution was that the actions of the masses together with the leadership of Lenin and the Bolsheviks. These were the two indispensable elements of the revolution, but they were indispensable because they were intimately and dialectically connected. No one captured this phenomenon better than the American journalist John Reed, who was on the scene and wrote a vivid account of 1917 in Ten Days that Shook the World. Reed portrayed the masses of workers and peasants entering history: active in the streets, on strikes, on the barricades, factory committees, in the Soviets and in the Red Brigades. The people demanded the immediate satisfaction of their demands and were willing to defend their gains to the death against the Kerensky counterrevolution. Reed also shows us the activity of the Bolsheviks who were also in the streets and who adapted to the mood and demands of the people and gave them expression in slogans, declarations and newspapers and in this way won the leadership of the people. By November 1917, the Bolsheviks had become a party of 400,000 and were the leading party in the duma and soviets of the major cities. In Russia in 1917, like this soldier, millions of workers and peasants grasped the real meaning of Marxism better than this student, and like this soldier saw Lenin and the Bolshevik as expressing their interests. One of many examples Buck gave occurred during the summer of 1917, when the peasants were demanding land but all the other revolutionary parties, including the Social Revolutionaries, the party that had initially raised this demand, insisted that the peasants wait for the Constituent Assembly to pass a law. Reed said simply that by November 1917 the Bolsheviks were the only party with a constructive program and the power to carry it out. And if they had not assumed power when they did there was little doubt “that the armies of Imperial Germany would have been in Petrograd and Moscow in December, and Russia would again be ridden by a Tsar. The second point that needs to be made is what the revolution meant for Russia after 1917: namely, it was a revolution by workers and peasants for workers and peasants. Naturally, most of the ideological attack on the Russian Revolution has come from and continues to come from intellectuals and academics: from George Orwell to Hannah Arendt, from Robert Conquest to Robert McNamara from the authors of The God that Failed to the authors of the Black Book of Communism. So, it is necessary to emphasize that the Russian Revolution was not by and for intellectuals. It was a revolution by and for workers and peasants. It was not to make life better for intellectuals but to make life better for workers and peasants. And the Russian Revolution did exactly that. The revolution ended exploitation, a system where a class of capitalists and landlords profited from the labor of workers and peasants. Under the new system of socialism, factories and land, mines and mills, transportation and communication became the property of the whole society. The revolution brought economic growth: under this system economic growth occurred every year between 1917 and 1985, except for the years of World War II. The revolution brought employment, job security and rising incomes: At a time when Americans have suffered 30 years of job losses in basic industry and stagnating or declining wages, it is important to recall that the Soviet Union provided full employment, rising incomes and job security. No worker could be fired without the trade union’s approval. Health care: At a time when the Republicans and Trump want to deprive 27 million Americans of health insurance, it is important to remember that the Soviet Union provided free health care for all. Education: At a time when most American students leave college deeply in debt and more and more education is privatized, it is important to recall that the Soviet Union provided free public education for all, including college and trade schools, and including living stipends. Pensions: At a time when more and more Americans lack pensions and the retirement age is being raised, it is important to recall that the Soviet Union provided pensions to all men at age 60 and all women at age 55. Vacations: At a time when the average American gets two weeks paid vacation, it is important to recall that Soviet workers enjoyed four weeks paid vacation. Equality: At a time, when income inequality is greater than it has ever been, and the average CEO makes 210 times the wage of the average worker, it is important to recall that under socialism there was rough income equality, with the highest income being only 10 times higher than the average income. Culture: And the revolution brought not only bread but roses, too. The Soviet people read more books and journals, attended more films and plays and concerts and visited the museums more than the people in any other country in the world. Women: Marx said the freedom of any country could be measured by the freedom of women. The Soviet Union granted some rights and benefits to women well before capitalist countries and some rights and benefits that the capitalist countries have never granted. Suffrage: The revolution brought suffrage to women, three years before it occurred in the U.S., 23 years before Quebec and 30 years before in France. Integration into workforce: The revolution fully integrated women in the workforce. Pensions: Women received full pensions at age 55. Women obtained paid maternity leave, something that rarely occurs under capitalism. Women achieved free child care, still unavailable under capitalism. Women had access to public laundries and canteens, something unheard of under capitalism. The revolution brought women liberal divorce laws and reproductive rights. In 2015, Svetlana Alexievitch won the Nobel Prize for a highly dubious book called Secondhand Time, in which she tries to counteract this nostalgia by colorful but undocumented oral histories. Still, she could not deny the pervasiveness of the nostalgia. She quotes a professor: “Today’s students have truly seen and felt capitalism: the inequality, the poverty, the shameless wealth. They’ve witnessed the lives of their parents, who never got anything out of the plundering of the country….They dream of their own revolution, they wear t-shirts with pictures of Lenin and Che Guevara.” She says there is a new demand for everything Soviet—Soviet-styled cafes, Soviet candy, Soviet salami, and Soviet vodka. There are dozens of Soviet-themed TV shows, and scores of websites devoted to Soviet nostalgia. Of course, nostalgia for socialism is not the same as a desire to fight for socialism, but nevertheless it does show that majority of the Soviet people have not bought capitalism’s version of socialism. The third point that needs to be made about the Russian revolution was that it had an enduring international impact. In the immediate aftermath of the revolution, workers throughout the world came to the revolution’s defense. Workers from around the world formed international units of the Red Army in 85 Soviet cities. Revolutionary uprisings occurred in Germany, Hungary and Finland. Tens of thousands of workers in Europe and North America demonstrated in support of the Revolution. In the U.S. Elizabeth Gurley Flynn of the IWW, Eugene Debs of the Socialist Party, and William Z. Foster leader of the great steel strike of 1919 all became partisans of the Russian Revolution. After witnessing the revolution, John Reed returned home to help form the Communist Party. In Canada, Tim Buck and others inspired by the revolution formed the Communist Party of Canada. It is no exaggeration to say that in the 20th century, every Communist Party, every socialist struggle, every struggle against fascism, every struggle against colonialism and for national liberation, and many struggles for simple labor and democratic rights drew inspiration from the Russian Revolution and in many cases benefitted from direct material support from the Soviet Union. This was true of the great Chinese, Vietnamese and Cuban revolutions. It was true of the anti-colonial struggles in Africa. It was true of the Palestinian struggle and the struggle against South African apartheid. This meant in turn that nearly all of the heroes of progressive struggle in the 20th century were partisans of the Russian Revolution. Fidel Castro said that until 1986 the Soviets provided a lifeline for the Cuban revolution. The Soviet Union provided a market for sugar and supplied the country with food, fuel, soap, and even the wood for burying the dead. Che Guevara returned from a visit to the Soviet Union and said that he was convinced the working class remained in power and he was impressed that 260 million people were living free of competition and the lust for money. All of the leaders of the African National Congress—Nelson Mandela, Waltr Sisulu, Oliver Tambo, Joe Slovo and Moses Kotane were partisans of the Russian Revolution. Even labor and democratic movements seemingly far removed from the revolution were nonetheless positively influenced by it. This was true of the labor movement. In the immediate aftermath of the revolution, trade union membership in France and Italy grew in each country from a couple of hundred thousand to over 2 million. In Canada and the United States, Communists were encouraged to bring class struggle ideas into the reactionary trade unions of the AFL. And in the 1930s, Communist trade unionists were in the forefront of the struggles to organize the industrial workers of the CIO. The Baath socialist system in Iraq, the Libyan socialism under Quadaffi, and the present-day Baath socialism of Assad’s Syria drew inspiration from the Russian Revolution. Though Arab socialism was not exactly proletarian socialism, these systems nonetheless emulated Soviet public ownership, free education, free health care, and women’s rights. It is no accident that after the fall of the Soviet Union, U.S. imperialism targeted each one those countries for regime change. Even the modern women’s movement and gay liberation were indirectly inspired by the Russian Revolution. The inspiration for the modern women’s movement was Betty Friedan’s book, The Feminine Mystique published in 1963. Friedan had many connections with the Party and worked for the Communist-led United Electrical Workers Union. The modern gay liberation movement traces is origins to the Mattachine Society, founded by Harry Hay in 1950. Harry Hay was a one-time Communist who organized the Mattachine Society on Bolshevik principles. When we look at these impacts, we can affirm that one hundred years later the Russian Revolution continues to shake the world. Long live the Russian Revolution!